Food is one of the last things people think about when it comes to packing for a move. If you plan on throwing everything in a box, you’ll be missing out on some important steps and could be taking up unnecessary space on the truck and in your new home. Follow these tips on packing for a move to make the most of what you have, avoid wastefulness, and keep the transition smooth. Different items require different supplies to offer the safest transition during a move. For food, you’ll want to have coolers, insulated bags, and ice pouches for your cold and frozen foods. For dry items, regular boxes will do but make sure you have packing paper on hand to fill in gaps so there is no shifting in the boxes when they’re moved. You don’t want things getting squashed! Fragile items, such as glass jars or bags that could be easily broken open (such as bags of rice), should be packed in separate boxes that are clearly marked as such. Wrap glass items in packing paper or bubble wrap. Line the bottom of the box with packing paper or towels and fill in the gaps so nothing will shift and bang up against each other. Use small boxes for the heaviest items such as jars and cans. Layer the heavier items on the bottom of the box with lighter items on top and fill in the gaps with packing paper. Also, be careful not to pack too many heavy items in one box, otherwise the box will become cumbersome and too heavy to safely move. The last thing you want is for someone to hurt themselves or drop the box and cause all the containers to break and spill. Before you start packing, go through your pantry and refrigerator and get rid of anything that you don’t want. Expired food should be immediately tossed. If there is anything that isn’t expired but that you don’t want to eat or take with you, consider donating it to a local organization that accepts food or seeing if anyone in the neighborhood could use it. Cook any food you have that will be expiring sometime around your move so it doesn’t end up going to waste. You don’t necessarily have to eat it before you move. You could prep and freeze it so that once you move in, you already have some food ready to eat for the first few days in the new place. This is especially good to do with any meat you’ve purchased so it doesn’t end up going bad. Chances are, you won’t feel like cooking during or right after your move, so having some meals already cooked and ready to go will make things a lot easier on you. Is your new pantry or kitchen storage more limited in the new place? Get an idea of how much space you’ll have available before moving in so you don’t inadvertently end up taking more food than your new space can accommodate. It’s a good idea to meal prep before moving day and put aside a box of snacks and other important food items in a dedicated box. 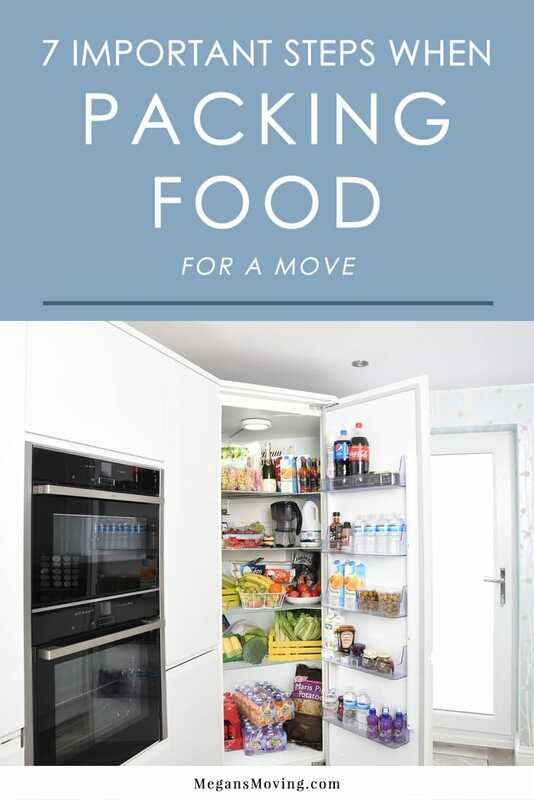 Food should always be one of the first things you unpack, but if anyone wants something to eat in the transition time in-between (particularly during the actual move), they won’t have to go searching through everything to find it if it’s already put aside and labeled.